Hello all. I’ve decided, based on my last post, to write a series of 10 more blog posts based on my advice that I gave in my last one. I’m going to try to put a new one out each week for the next ten weeks. Maybe more often depending on how fast I write them. I hope my thoughts and insights prove useful to you! I’ve begun to tell people, especially college students, that they should seek to do hard things, but for the right reasons. This may seem like a piece of common sense reasoning, but I don’t see a lot of it in many of the students that I’ve interacted with. 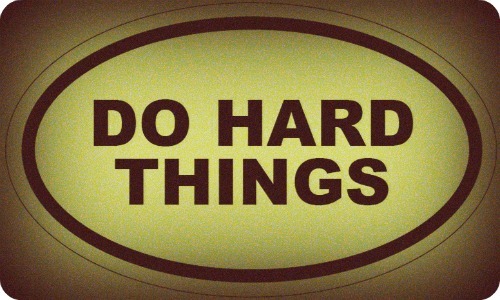 Doing hard things… where to start. Well, first, if you’re in college you probably already feel like you’re doing hard things. Studying for exams, writing papers, (hopefully) doing extra curricular activities, maybe even holding down a job. When I was in the tail end of my second year in University, I was working 30 hours per week while being involved in two very labor intensive extra curricular clubs. On top of those things, I was working as an RA and taking a full load of classes. During that time, I was sleeping maybe 4.5 hours a night, often less than that. It was a grueling time when I felt like I had little time for myself to relax and unwind. I ended up being told by a doctor, whom I talked to after having a chest cold for two months, that I had “walking-pneumonia”, and that if I didn’t slow down I would eventually get full blown pneumonia and possibly have to go to the hospital. It was incredibly discouraging but I was able to find ways to slow myself down a bit. I worked fewer hours, was able to give up some of my responsibility in the clubs, and actually made myself a schedule. In my second to last semester in college, I went for a study-abroad tour in France. I organized this trip mostly on my own. Finding my own place to stay, filling out the paperwork for admission to the University of Strasbourg and the student visa issues, and a lot of other details. Needless to say, this was a pretty difficult process, but I was willing to because of the “adventure” that living in France would be. I learned a lot while I was over there, particularly French (which was the main reason for going.) But living in France was definitely one of the most difficult things I’ve ever done. I remember landing at CDG and hearing an announcement come over the intercom in French… I had absolutely no idea what was said and I was gripped by mild panic. Not for the last time. The 4 month stint there was good for my education, but not much else. I struggled to make friends, both because of the language/cultural barrier and because of my own natural introversion. I spent a lot of time in my room, tired because I was emotionally spent. The guys I lived with were a great joy and the church I was a part of gave me some relief, but not enough. When I returned to the US, I was so relieved and overjoyed to be back in familiar surroundings with friends and family. France was a hard learning experience, I’m not sorry I did it, but if I could, I would give my past self a lot of advice about the trip. As graduation approached, I spent a lot of time looking for internships and jobs in my line of work. As an in-debt college student, the prospect of moving to DC (one of the most expensive places in the nation) to do an unpaid internship that would average 30 hours a week did not sound ideal. Thankfully, (to make a long story short) I was offered a position at The International School of Kabul, in Afghanistan. My initial job there would be on an intern level, making a stipend but with room and board paid for, as well as a plane ticket to and from. Moving to Afghanistan wasn’t as hard for me as moving to France had been, interestingly enough. One of the main reasons for this was that I had wanted to visit Afghanistan since before 9/11, as odd as that may seem. The second reason the transition was easier is because of all the people that I was going over there with. Having a community of people that you can relate to and trust makes possibly more difference than anything else. Anyway, here’s the conclusion area. I’ve done hard things, but for different reasons. In college, I made hard choices because I felt the pull of outside forces that drove me to do things (wanting to get a good job, wanting to have money to spend, etc.) I went to France because I thought it would be an adventure, sure I wanted to learn French, but I really wanted to travel and experience things “on my own”. It was a decision that was mostly ego driven and ended up being a borderline miserable time filled with a lot of loneliness and frustration. Finally, I moved to Afghanistan for several reasons. I needed a job that was in my field, but more importantly, because it had been on my heart and in my mind for years. Sure, the adventure seeker in me wanted to go, but it was the desire I had to try to be a change in the lives of people living in war-torn poverty that drove me… and that ultimately kept me there until recently. Doing hard things always sounds good at the outset, but you (or at least I) can’t do them for their own sake without risking misery and failure. Learning balance is a huge thing, but even if your work life is out of balance (like things often were in Kabul) your motivation for something outside yourself can and will make all the difference. Kabul is certainly the hardest place I’ve ever lived and where I was put in situations both in work and security-wise that I would not wish on anyone. But I wouldn’t trade it. The lessons learned there for my faith, my professional life, and my emotional maturity are treasures I wouldn’t part with. I think that I was able to learn these things and do what I did was because I was working for something other than my self-promotion or for my own ego, I was working to make the world better in the way that I best knew how. I advise you to find the way you can do that, and then go after it. Hard things will come, lessons will be learned, and you’ll be better for it. Just work up the guts to try it (even work up the guts to fail at it), keep trying and trudging on. It ends up being worth it!